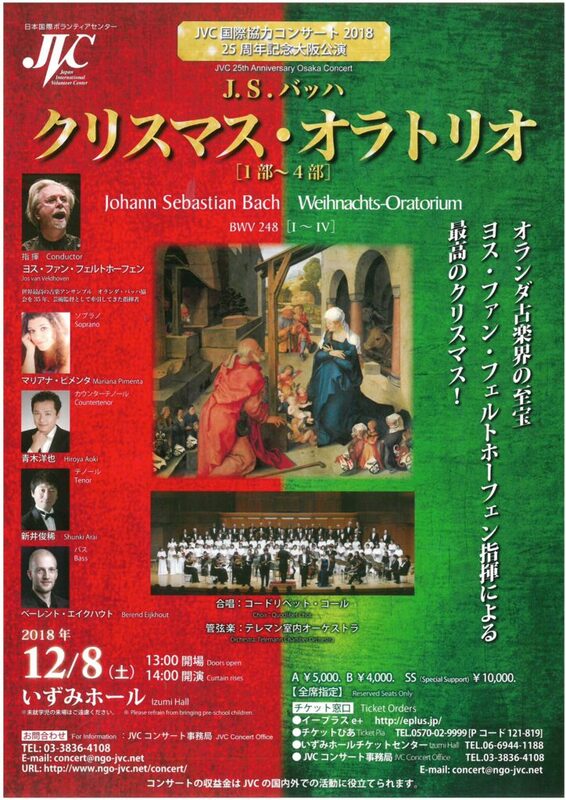 We are very happy to inform you that JVC 2018 concerts will be held in Tokyo on Saturday, December 1st, and in Osaka on Saturday, December 8th. This year, we are approaching the finale of the concerts. The JVC benefit concerts have been held for 29 years in Tokyo since 1989 and for 24 years in Osaka since 1994. Although the sale of the tickets has been satisfactory, we finally decided to put an end to the concerts. This is because of the difficulties in maintaining a sustainable operation and a positive balance of income and expenditure. The final concerts in 2018 will invite the conductor Jos van Veldhoven, the greatest treasure of early music in the Netherlands. The profits from both concerts in Tokyo and Osaka will help improving the lives of people in our 11 project countries. ・7 minutes from Sangenjaya Station on the Denentoshi Line. ・Please refrain from bringing pre-school children. ・No parking on campus is available. ・5 minutes from JR Osaka-jo Koen, 10 minutes from Subway Osaka Business Park, 15 minutes from Keihan Kyobashi. What are the purposes of the JVC Benefit Concert? 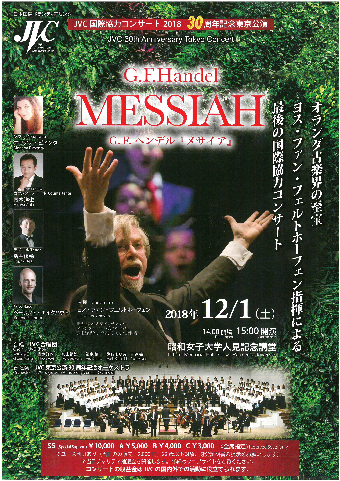 Every year JVC organizes its annual benefit classical concerts in Tokyo and Osaka with the participation of conductor and soloists coming from all over the world. The purposes of the JVC benefit concerts are to raise funds to support JVC’s fieldwork and to create a greater awareness of international cooperation. Volunteers are working together and make a difference. All the profits from the concerts go toward JVC activities in 11 countries in Africa and Asia. The concerts have raised about 260 million yen in total and been enjoyed by some 55,000 audiences to date. Here is a video of JVC Benefit Concert hold in Tokyo in 2015.